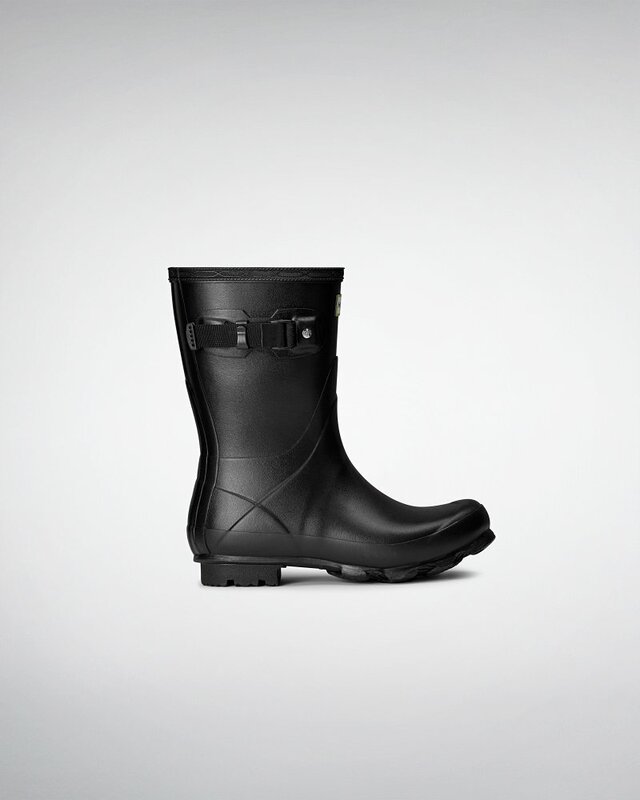 Women's Norris Field Short Rain Boots is rated 4.2 out of 5 by 6. Esta bota de agua corta para mujer, que recibe su nombre del fundador de Hunter, Henry Lee Norris, se ha fabricado para un uso continuo en distintos terrenos. Hecha a mano con un compuesto de goma blanda nuevo y mejorado, que le otorga una mayor durabilidad y comodidad, la bota fusiona el diseño exclusivo de la icónica bota alta Original con nuevos avances técnicos, que le proporcionan una mayor resistencia. Se ha incluido un panel reforzado para mejorar la estructura y la sujeción, mientras que la robusta suela Field con un nuevo diseño con dibujo de zig-zag garantiza el agarre y la eliminación del barro. Rated 3 out of 5 by Mcs5 from Hunter boots Purchased same size as usual, but boots are way too big. Unable to return because I don’t have original box as it went out with the wrapping paper after we opened gifts. Rated 4 out of 5 by themtron from Great boots Functionally and aesthetically they worked perfectly. They ran big however. I wish Hunter had half sizes. Guess I’ll need to get some of the cable knit inserts and wear thick socks. Otherwise, I quite like them. Rated 5 out of 5 by Britt B from Cute, comfy and practical Love these boots! Took these boots out during sideways rain the other day and they passed the test! My feet stayed warm and dry. They did come a hair big, but I like having a little room inside for my toes to wiggle. To keep my toes warm, I purchased the cozy boot socks. They did a great job as well! Rated 5 out of 5 by jessica from Super Comfortable I bought the boots a month ago, and I've been super satisfied since then. They're really comfortable and easy to slip on and off. I would recommend buying at your size, it was a perfect fit for me. Rated 5 out of 5 by MistyNY from Great fit!!! A girls rainy day dream wear, so comfortable and perfect for the heavy rain we've been getting these past few weeks! Rated 3 out of 5 by mitchsh from Too wide opening Loved the support on the bottom- very comfortable. But the calf opening was too wide for me so I ended up returning them for the Original Slim / Refined boot. Pictures of both are below to compare opening. The Slim/Refined boots were also a little lighter in weight which I liked better. Normally a 7.5 in most shoes. Based on other reviews (Zappos/Amazon also), I ordered a 7 and they fit great.